Hello! I felt like it was time for a blog update. This time it’s not so much about writing, but something slightly different. At the weekend I went to my first doubles tournament at Warhammer World. Which was a great experience (despite some awful powergaming by some grumpy bastards from Leeds.) Even though we didn’t win a game, we still had a great time and there were a couple of hilarious games. One including a complete vendetta against my Heldrake, which resulted in a draw. 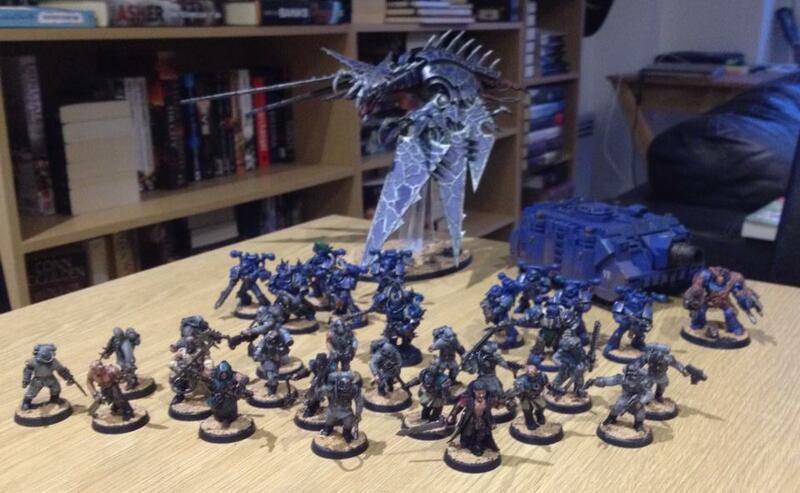 My team-mate Chris played Dark Eldar so I decided to start my Chaos army. Had I know they were desperate allies, which severely hindered us, I would have chosen something else. THE CATHEDRAL BURST into a ball of pyrotechnic fury as stained glass windows exploded from the pressure change. Brother-Sergeant Amatius didn’t see where the shell had come from as he proceeded on foot into the vast nave, his back to the firer. His squad fanned out either side of him, bolters blaring at the unseen enemy. Smoke and the smell of cordite hung in the air. The stained glass fell from the windows, crashing amongst the knocked over pews as screams pierced the gloomy air. They weren’t the screams of glass-cut agony, but screams of delight. A group of warriors, clad in spiked blue armour, rushed the Space Marines from the aisles. Splinters from their rifles peppered the cathedral and lodged in the wooden seats. The Ultramarines ducked behind what cover they could find, but brother Portius was thrown from his feet by the force of a blow. The splinters stuck out from his armour at jaunty angles and he knocked them away with a sweep of a vambrace before crawling towards a plascrete pillar. Amatius returned fire with his boltgun and the two nearest eldar disappeared in a cloud of thick, arterial gore. Vertebrae hammered the pews as the aliens were blown apart by the concentrated fire. To his left, Caius discharged his meltagun, liquid fire cooking the last of the onrushing aliens. The Codex Astartes was clear in this situation and he was confident his brothers would clear out the cathedral in an efficient manner. A grinding of metal on concrete behind him made Amatius turn. An Ultramarines Vindicator was crossing the threshold of the cathedral, entering the nave and adding its thick exhaust fumes to the smokey interior. What was it doing; entering the building with a vehicle was madness. Amatius tried to raise the commander on the vox, but was met with white static. He waved at the vehicle to slow and the vox suddenly flared into a scream of feedback, overloading his auto-senses. Amatius ripped his helmet from his armour throwing it to the floor in disgust, dulling the vox squeal. He looked up, regaining his composure, as another shell flew through the air and detonated sending out a wave of high pressure that squeezed against his skull. Shrapnel spread across the room and Portius cried out as scalding-hot metal ripped through his leg, severing the bone. Bright blood pooled around the stricken Ultramarine. Amatius tried to reach his comrade, but was forced back by the sea of eldar warriors. Madness, he thought. What had got into the Vindicator’s commander? This wasn’t the Ultramarines way, they had strict codes and doctrines that prevented this kind of folly. He dodged another attack and brought his chainsword up in reply. The spinning metal blades made easy work of the eldar warrior and sprayed blood across his deep blue armour. Amatius looked for Portius, but he was still on the ground as enemy warriors crowded him. He fought back furiously with combat knife and fist, breaking through armour like paper, but they would soon overwhelm him. Malius was the nearest Ultramarine to Portius, pinned behind a pillar to the squad’s right. ‘Malius, break through to Portius and engage a withdrawal, now!’ Amatius shouted, the vox hardly necessary in the acoustics of the cathedral. The Space Marine looked back in the sergeant’s direction, and shook his head slowly from side to side. What was he doing? Portius needed his support. Amatius tried to edge closer, but the eldar still blocked his path. He hacked and slashed with his chainsword, pushing the aliens back, but their numbers weren’t thinning. The eldar had lured them into this trap and their only way out was by forming an organised withdrawal past the Vindicator, but first they would need to regroup and cover each other. He unclipped a grenade from the mag-lock at his waist and primed the fuse. While fending off the aliens with his chainsword, pushing the blade into their faces, blood splattering, he lobbed the grenade in an overarm throw. Amatius hoped it would cause enough damage in the close confines to confuse the enemy. With a crack of releasing pressure the grenade detonated. Body parts and blood flew through the air in deep crimson droplets, decorating the scene in a macabre hue. The remaining eldar hissed and wheeled on the spot, retreating further into the church. Amatius signalled to his men to regroup on his position, but before they could respond he rushed to where Portius lay. The Space Marine was a ruined mess where he had fallen, breaking a pew in half as it collapsed underneath his weight. The sergeant checked for life signs, but there were none. He sighed and placed the warriors weapon on his chest, before clasping Portius’s lifeless hands around the hilt. He looked up at his men, but only Caius and Praxis stood by him. ‘Where are the others?’ he asked, before standing to look for himself. As Amatius gained a view of the cathedral nave, he saw Malius walking away in the direction the eldar fled, his bolter relaxed in his gauntlet down by his side. ‘Malius, what are you doing? Regroup!’ he shouted after his brother. The Ultramarine didn’t respond, but kept walking as the sound of the Vindicator revving it’s engines drowned out the Sergeant’s protests. Malius’s armour-mounted speaker elicited a hiss followed by a deep, resonant voice Amatius didn’t recognise. ‘Not Malius.’ He paused in his tracks and looked back, deep green-tinted lenses boring into his sergeant’s skull. ‘I am Alpharius.’ he said as the next wave of eldar warriors pushed past him, like a tide around rocks. Splinter rifles spat their charges once more. The last sound that Sergeant Amatius of the Ultramarines 6th Company heard was the deep rumble of a shell exploding as the traitorous Vindicator finally lowered its aim. I wonder if the events team read the story or not, but presuming you got this far you have. My next blog post will probably surface at the weekend. For uni tomorrow night I’m required to think of a scene I have written and write a pastiche in the style of Charles Dickens. It is one of the hardest things I have had to do, I’m not good enough a writer to write in another person’s style, let alone one of the greats that is Dickens. If I get anywhere with it I will post it for you to read. Apart from that I have a story second draft deadline on Saturday so I will be spending the rest of the week bringing that up to scratch. Wish me luck. This entry was posted in 40K, News and tagged 40k, alpha legion, battle brothers, bugmans, can of snakes, chaos, chaos space marines, charles dickens, codex astartes, dark eldar, far worlds, heldrake, imperial fists, leeds, lenton, nottingham, pastiche, space marines, the long war, tournament, ultramarines, uni, vindicator, war, warhammer, warhammer 40.000, warhammer 40k, warhammer world, writing. Bookmark the permalink.